So This Is Berlin, this Norman Rockwell painting, appeared on the cover of Life Magazine published September 26, 1918. This was the eleventh cover by Rockwell to appear on Life Magazine. 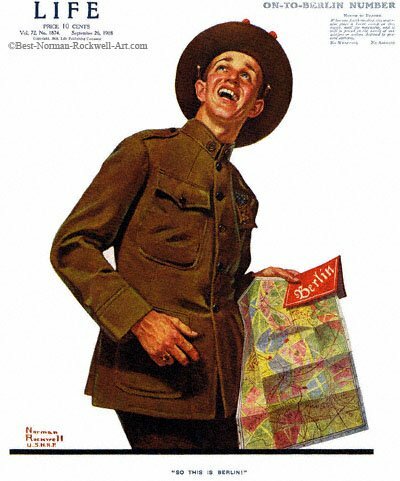 A Rockwell painting appeared on Life magazine's cover a total of ten times in 1918 and twenty-eight times in all. Coincidentally, the Allied attack on the Hindenburg Line actually took place on the publication date of this issue. The painting on this cover depicts an American soldier actually in Berlin. He almost looks like a tourist in uniform. The expression on his face is definitely a tourist expression. This soldier is not carrying a gun. He doesn't appear to have a weapon of any kind. He looks almost relaxed. Rockwell is obviously painting optimism here. Certainly the war is going the way of the Allies, but an Allied victory is not yet a sure thing. Yet Rockwell was correct about the war's outcome. The signature at the bottom is Norman Rockwell, U.S.N.R.F (U.S. Naval Reserve Forces). Rockwell was still in the Naval Reserve when this painting was finished.